Religion is one of the biggest scams in human history.... br br br I´m also a member at islcollective and busyteachers. All my wss can be found there too. Happy teaching. 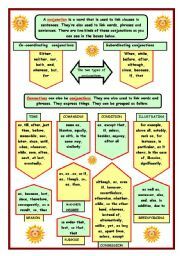 Here´s a chart with conjunctions/connectives. 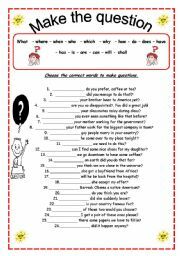 I use it as a handout for my students. I sometimes play a game naming some of the connectives and the sts have to guess what type of conjunction/connective it is. I hope it´s useful for some of you out there. Happy teaching! Here are some slang expressions. 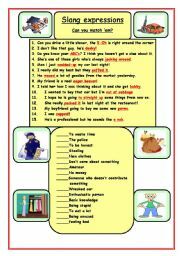 Students hardly ever get the chance to learn them although it´s very often used in daily conversation. This is not for the yougsters but for adults who are tired of studying grammar all the time. I hope it´s useful for some of you out there. Happy teaching! 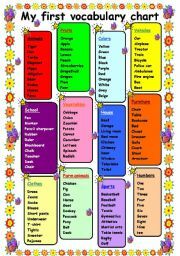 This is a vocabulary chart for beginners with some basic words categorized in groups. I used to have another one but lost it some how so, I made a new one. I mostly use it at the end of the lesson to brush up the sts reading skills. I hope it´s useful for some of you out there. Happy teaching! Every year I give all my students a little Christmas gift. This year it´ll be a Christmas wall poster. Blow it up to a4 format and there you go. I thought some of you might find it useful too. I hope you enjoy it. As always......Happy teaching! 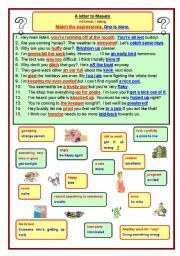 Here´s a ws (3 pages + answer key) containing slang and informal/everyday English. Sts have to match the expressions, read a letter and re-write the letter. I hope it´s useful for some of you out there. Here´s a chart with some adjectives categorized in groups such as, sound, color, feeling, condition, appearance etc. 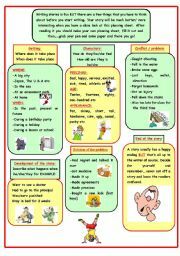 I use it as a handout when the students have to write/tell a story. I also use it to improve their reading skills. There are lots of ways to use it. Happy teaching.